For the last 5 years I have had the privilege of riding Fiddler, a 24 year old semi-retired dressage horse. Those of you who follow my Instagram will know what an incredible horse he was, he was a cheeky character and taught me a huge amount, bringing my riding on leaps and bounds. Fiddler was also a very strong character and didn’t know any signs of being ill up until a week before he was PTS. I want to share a bit of Fiddler’s story with you but also how to make the most of every second you spend with your horse. Fiddler had developed an abdominal tumour, he fought hard up to the week before he died but then suddenly lost all fight and very sadly had to be put to sleep on the 13th April. I cannot say for sure how long Fiddler was ill for but we went hunting in December and I can safely say he was more than himself then! We also did our very first beach ride in January which we both loved so I can only hope that the tumour had been developing over the last few months and not any longer than that. Since January I only noticed some tiny changes in him; his energy levels did drop slightly, his coat wasn’t as healthy as it could be, his weight had dropped off the month before. At 24 I put his energy down to older age, his coat down to coming out of winter and his weight down to needing spring grass. In hindsight, yes, I should have picked up on his steady decline and I feel awful for having noticed and not done much about it. I feel that if I’d acted earlier it may have given us some more time. Some may say that I’m being harsh on myself and that I wasn’t to know but I hope by putting it out there, others won’t make the same mistake I did. Having said that I do believe that Fiddler was strong enough to cope with the work we did continue to do. Having being busy with work and study I didn’t have the time to ride a lot so I never pushed him due to knowing his fitness wasn’t at its peak. Looking back through jumping videos I also feel that you couldn’t even tell the difference between later and earlier videos, his performance barely altered. *I was abroad when Fiddler fell very ill and he didn’t make it before I got home, so I never really got to say goodbye. But before I went away I had one last happy ride with him, got some of my all time favourite photos and I’d given him some extra love as I knew I wouldn’t see him for a week due to my holiday. So, despite being heartbroken about not being able to see him one last time I didn’t regret my last hours at the yard. 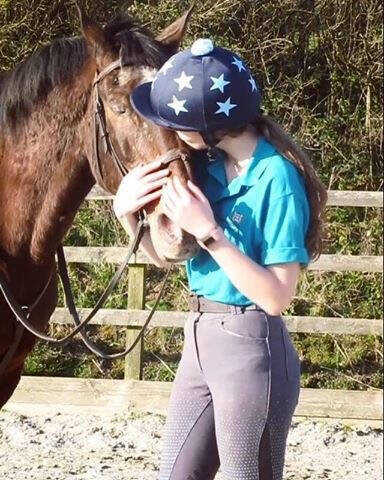 Finally, losing a horse is hard no matter what the circumstances are, whether you have a horse, loan a horse or just have a favourite at the riding stables. There is no right or wrong way to grieve, it’s okay to not have it together all the time and there is no set time for a heart to heal. All I ask is that you don’t give up your passion, give yourself some time and then get straight back in that saddle!